The Society of African Missions has, since late September 2017, championed the cause of Africa’s Great Green Wall. On Wednesday, 8 August 2018, the Minister for Communications, Climate Action and Environment, Denis Naughten, TD, formally launched an initiative the Society has developed with the Tree Council of Ireland: The Laudato Tree and Great Green Wall Initiatives. At the launch the Minister gave details of a major contribution of €1.2 million the Irish Government will make, at the behest and ongoing campaigning of the Society of African Missions, to the UN body responsible for helping the African Union deliver this epic and historic project – the United Nations Convention to Combat Desertification (UNCCD). Along the way we have ruffled some feathers but did so in the belief that this is a transcontinental project of historic proportions for Africa and the entire world. A project that Africa will deliver and must be supported in delivering by the International Community. We owe a heartfelt THANK YOU to a number of people who showed support and a willingness to listen to our campaigning voices. Amongst these are the Secretary General of the Fine Gael Party, Tom Curran; the Government Chief Whip, Minister Joe McHugh TD; two members of the Oireachtas who represent Cork, leader of Fianna Fail, Micheál Martin TD, and the Tánaiste and Minister for Foreign Affairs, Simon Coveney TD, both of whom made time to visit the SMA headquarters to listen to members of the SMA Council and Justice Committee about our belief in this African initiative. We wish also to express our sincere thanks to Fr. Padraig Devine SMA who strategically supported our efforts through direct contact with Ministers Joe McHugh and Denis Naughten, again encouraging them to respond positively to the United Nations invitation requesting Ireland to play an international leadership role in promoting the Great Green Wall. 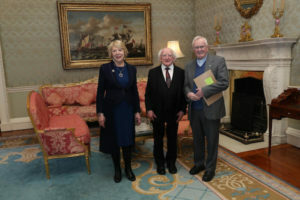 We must express particular gratitude to the President of Ireland, Michael D. Higgins, who was the first official representative of the Irish State to recognize and respond with persuasive passion to the concept of the Great Green Wall and who hosted a memorable gathering to inaugurate our Laudato Tree and Great Green Wall Project at Aras an Uachtaráin on 26 March 2018. As well as a rousing and inspirational address made to the people of Ireland that evening, we have noted that President Higgins has continued to keep Africa’s Great Green Wall before the Irish people in successive speeches he has delivered since then. We have no doubt that his genuine support has played a major role in getting us to this momentous achievement. Finally, we must single out Minister Denis Naughten, the most senior Minister to attend the meeting organized by Minister McHugh at Government Buildings on Tuesday 27 March 2018. There was a moment when a particular intervention appeared to pour cold water over the UNCCD invitation to Ireland to play a key role in championing the Great Green Wall. However, after an impassioned plea by a member of the SMA delegation, Minister Naughten assured us that he would review the United Nations invitation and would bring it to Cabinet. That, he most certainly did, and has achieved a commitment from the Irish Government of €1.2 million to enable the UNCCD to carry out a much needed inventory of the transcontinental project, so that the Irish Government can then help to identify areas where major international donors, including the European Union, might be more efficient in helping the African Union to deliver the Great Green Wall by 2030. We were honoured, therefore, that Minister Naughten, TD, agreed to officially launch the Laudato Tree and Great Green Wall Project for both the Society of African Missions and the Tree Council of Ireland, in his home territory, and the home territory of Fr. Padraig Devine SMA, Roscommon Town Park. 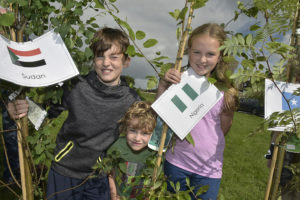 At the launch in Roscommon Town of the ‘Laudato Tree – Great Green Wall Project’ By Minister for Communications, Climate Action and Environment Mr. Denis Naughton TD. The Event was organised by The Tree Council of Ireland and SMA. In Pic l to r, Se Downey, Conall Downey and Roisin Downey, who all helped with the launch. 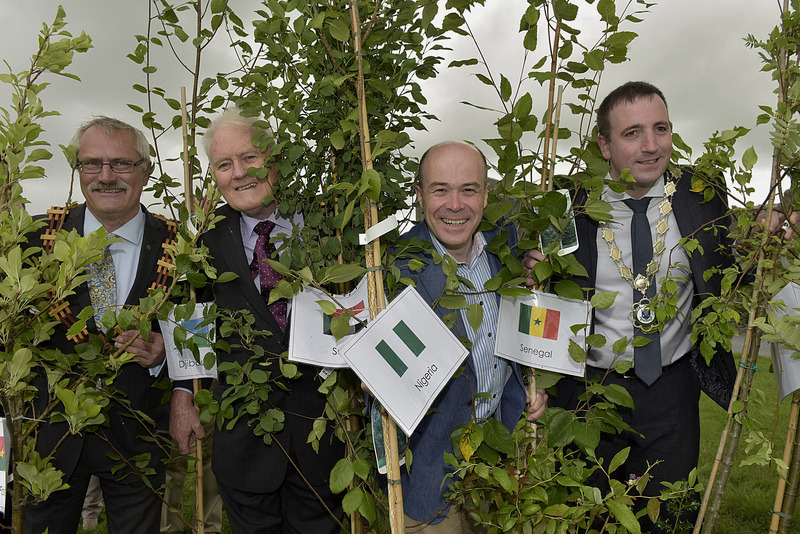 With the generous and enthusiastic support of the Tree Council of Ireland and in collaboration with Roscommon County Council, the first Great Green Wall line of 14 trees will be planted in October/November, representing Ireland and the 13 countries through which the Great Green Wall will traverse. For more information about the SMA/Tree Council of Ireland Laudato Tree and Great Green Wall Project, click here. On Wednesday, the SMA Communications Office will publish the Government Press Release issued by the Department of Communications, Climate Action and Environment, to note Minister Naughten’s official launching of the Project, in which he pays tribute to the work of the Society of African Missions. To everyone who has supported us in this journey so far, we express our heartfelt thanks. And we invite you to continue your support, for there is a long but hope-filled journey still to complete.